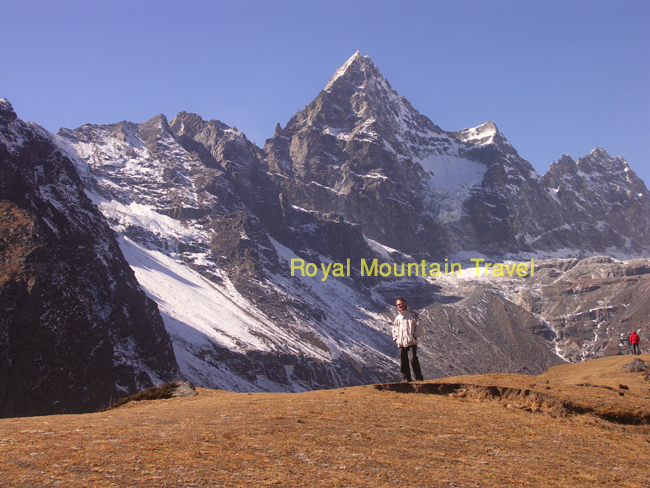 This challenging trek encompasses all the very best that the Everest region has to offer. 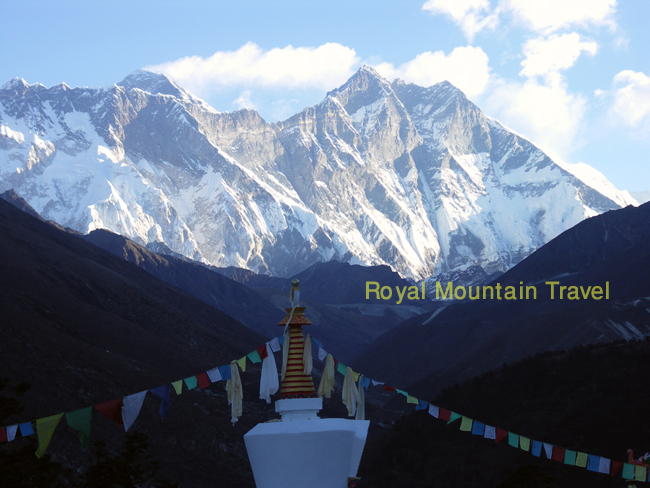 Gokyo Ri, Cho La Pass and Kala Patthar, are the three most astounding viewpoints in the Everest region. 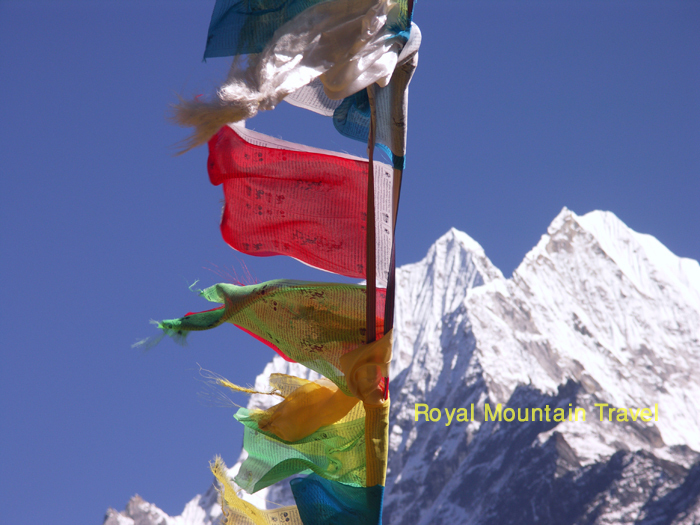 This trek takes you to Everest Base Camp Trek via the Gokyo Lakes and Cho La Pass, going up Kala Patthar for the most spectacular views of Everest. You climb gradually to avoid the problems that high altitude can bring. 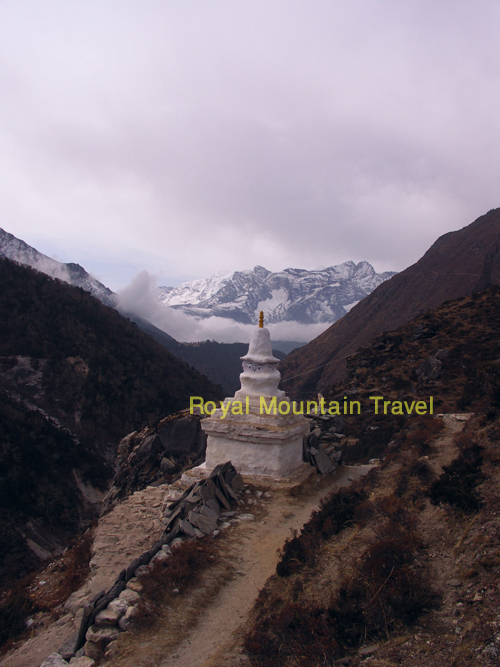 You will have days to acclimatize in Namche Bazaar and have short days walking as you steadily gain altitude. Along the way, you have time not only to take in the incredible landscape but to see the villages and way of life in this fascinating area of the Himalayas. Trek grade: This is a strenuous Grade 4 trek. The trails are not difficult but you climb to an altitude of 5360m Gokyo Ri, 5420m at Cho La, 5380m at Everest Base Camp and 5644m at Kala Patthar. You should be fit and be well prepared for this trek. At the airport, you are met by our team of sherpas who welcome us. You take a short break while the porters sort out your baggage that they will be carrying on a trek. To ensure that no one is overloaded, we do not allow any of our sherpas to carry more than 15kg. While on the trail, you will see many porters carrying three or four times this, sometimes even more. An acclimatization day allows for an excursion to Thame. Intricately carved mani stones mark the path to this village with a picturesque gompa on the hillside overlooking the valley. Leaving Namche Bazaar, the trail is very easy and chortens mark your way. You can see the twin peaks of Thamserku soaring up to the east. Here the legend of the yeti is alive and well and you can see in Khumjung’s red-walled gompa a yeti-scalp that has been preserved here. A large chorten marks the top of the ridge descending from Khumbila (5,761m), the abode of the patron god of the Khumbu region. The nearby settlement is said to be the birthplace of the lama who introduced Buddhism to the area. You descend to the beautiful little village of Phortse Tenga that sits on the banks of the Dudh Kosi. On your second short day to reach Machhermo, you start with a stiff climb of for about 40 minutes before the trail levels out and affords great views of the valleys on all sides. From here, you trek down to Dole where you might want to stop for a break. From Dole, you hike back up on to the ridge (which can be windy) to go to Lhabarma. It is a very short day, but essential to help acclimatization. You have plenty of time to take it easy and enjoy the marvellous views. Your trail passes through summer yak pastures and small settlements as it follows the valley side, far above the river. Another very short day, you continue up to Machhermo that has a fantastic setting with superb mountain and valley views. This small village is where the most credible yeti incident in the Khumbu region occurred. It was here in 1974 that a yeti was alleged to have killed three yaks and attacked a Sherpa woman! At Machhermo there is a health post where doctors provide information about the risks of high altitude sickness (the majority of their patients are generally porters). A steep climb leads up the moraine of the Ngozumba Glacier, the largest glacier in Nepal, past small lakes to the tiny kharka of Gokyo. Though strenuous, today is a rewarding day of trekking. You start with a steep climb up to the ridge above Machhermo, where you will get great views looking back towards Kantega and good views in front of you towards Cho Oyu. The trail levels as you pass Pangka and Nilibuk, and then you start to climb again, along with a narrow staircase trail to a small bridge that takes you to the first of the five lakes at Gokyo. The trail is flat but the 4700m altitude slows you down. After you pass the second lake you eventually reach Gokyo itself, which is located beside the much larger third lake. If you still have the energy, you might like to take a short walk up onto the ridge that overlooks Ngozumba Glacier. An early start, it takes about 45 minutes to reach the top of Gokyo Ri (5360m), one of the highlights of your trek. The view is every bit as impressive as that from Kala Pattar, near Everest Base Camp. Cho Oyu, Gyachung Kang, Everest, Lhotse, Makalu, Cholatse and Tawachee are all visible, the tremendous ice ridge between Cho Oyu, Ngojumba I and II and Gyachung Kang is one of the most dramatic sights of the Khumbu region – resembling a folding screen of ice, snow and rock. Below are the Ngojumba Glacier and serene glacial lakes. Returning to Gokyo, you then set off for Tangnak. Your trail starts by climbing to the crest of the moraine that overlooks the Ngozumbo Glacier. Your route across the glacier is well marked with cairns but you need to take care as the path is narrow and can be icy. The trail goes up and down as you go to the eastern side of the Gokyo Valley. You stay the night at Tangnak (4,700m) that is at the foot of the Cho La Pass. Another early start as you have a long day today. This is one of the most challenging days of your trek as Cho La is one of the high passes of this region and it can be slippery due to ice along the route. Climbing about 45 minutes up to a col, you see Cho La in the distance. It is steep climbing, especially for the last two hour until you reach the top of the pass. Take it slowly and steadily as in some places the trail is quite narrow. Be careful as rocks can sometimes fall down from the top. The top of the pass is decorated by prayer flags. The trail at the top of the pass is very narrow making it quite hard to walk but as you continue from here you will have new views of the valley and villages as you head downhill. Take care on the descent as it is steep and you cross a small glacier (usually snow covered) which is fairly straightforward. After scrambling down onto the glacier, you follow a trail down a rocky gully to pastures below. The trail becomes more defined as you approach Dzongla. This is a much easier day as you continue your descent. A short ascent brings you to the foot of Awi Peak, which you contour round on a wonderful high trail that offers great views of Chalotse and Tawoche across the valley. You eventually descend to join the main trail again just below Lobuche. 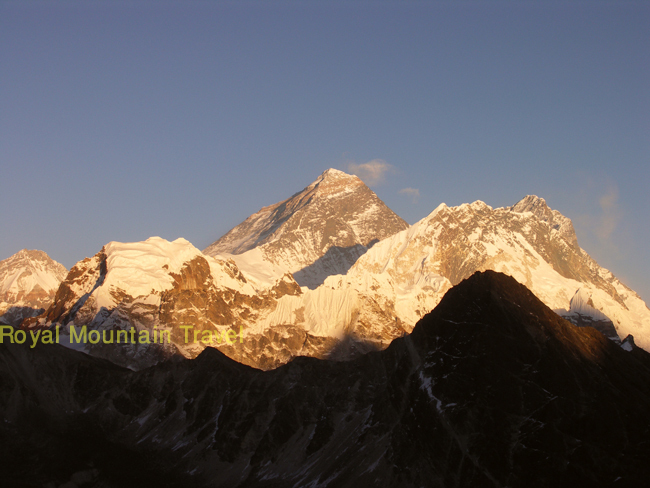 From Lobuche, the view straight towards Nuptse and the sunset are truly magnificent. Altitude makes the climb onto the Changri Glacier tough and this is a long day. The trail from Lobuche climbs steadily beside the Khumbu Glacier. It takes about 3 hours to reach Gorak Shep (5180m), a collection of lodges situated at the foot of Kala Pattar. From here, near a small, usually frozen lake, you climb up Kala Pattar, a 5545m peak that provides the best close up view of Everest. The descent back to Lobuche is not difficult, but altitude induced lethargy can make the many uphill sections below Gorak Shep seem endless. You descend through summer pastures and alpine meadows of scrub juniper and, in summer, a profusion of wildflowers and to Dingboche, the only place in the region where barley is grown. The mountain views are outstanding. A welcome rest day here provides the opportunity to hike up the Imja Khola to Chhukung, a small summer settlement from where the views of Island Peak (6189m), Lhotse, Ama Dablam and the fluted ice walls flanking the Amphu Lapcha pass are one of the highlights of the entire trek. Trekking through forests filled with a variety of trees such as birch, conifers and rhododendrons, you are still accompanied by views of Mt. 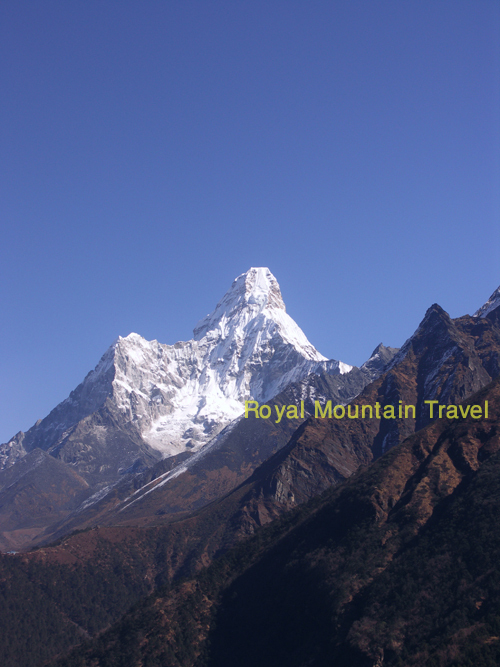 Everest, Lhotse, and Ama Dablam. At the bottom of the last stone stairway that leads up to Tengboche lays the small village of Deboche with its nunnery. The view from Tengboche is justifiably considered one of the most magnificent. 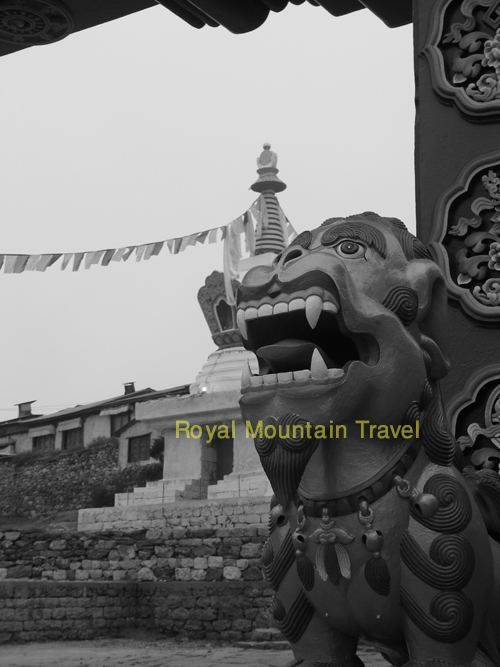 Tengboche Gompa is the cultural and religious centre of Khumbu. Founded in 1912, it has been destroyed and rebuilt twice as the result of earthquake and fire. Descending the steep trail from Namche, the trail gets easier as you get closer to Phakding where you stayed two weeks earlier. It is a long trek to Lukla, so you break your journey here and have a chance to relax in the afternoon. 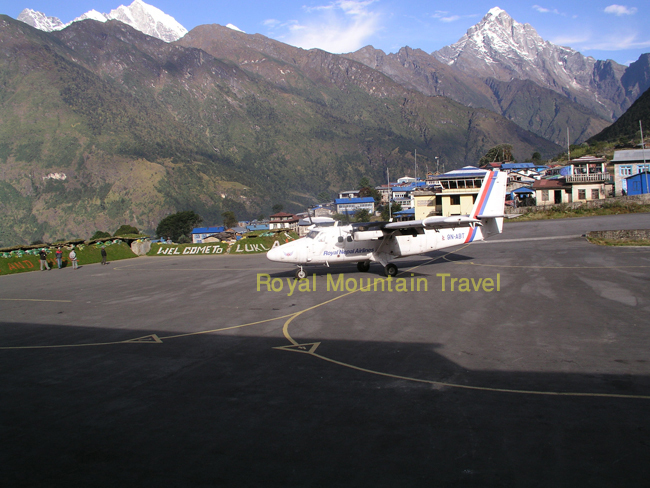 An early start, you flight from Lukla to Kathmandu. Flights all leave in the morning as by the afternoon the wind gets up and planes do not fly from here. You have the rest of the day free to spend how you like in Kathmandu. In the afternoon you might like to try out one of the many cooking classes or workshops on offer, go for some more sightseeing or do some last minute shopping. Ask your guide for suggestions. Transfer to Tribhuvan Airport to connect with your onward flight. Please note that you should check in three hours prior to your flight time.